Working in collaboration with local brand Get Matcha, Nanuki’s Matcha Explosion has been born! 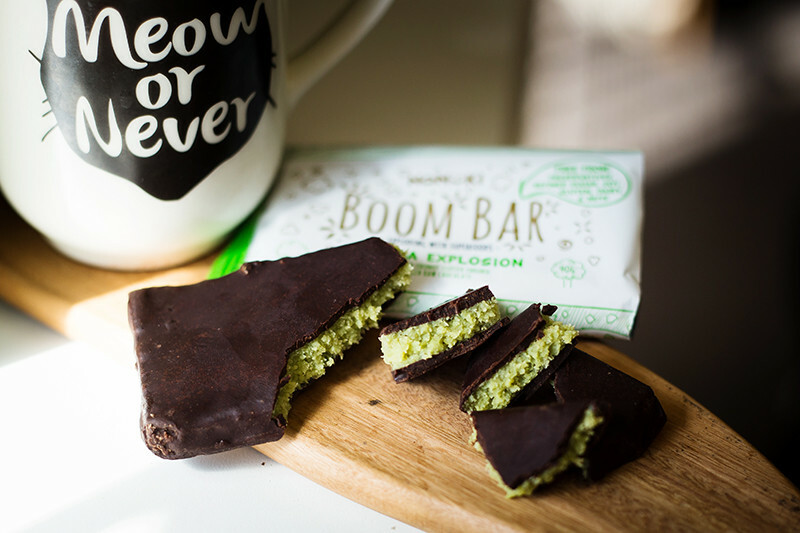 This Boom Bar is created as a superior quality Coconut Matcha ‘Bounty Bar’, enriched with antioxidants, iron, fibre, and protein for a nutritious sweet treat. Nanuki Boom Bars are a range of wholesome, filling snacks made with natural ingredients, free of all the usual nasties. Nanuki “Boom Bars” are enriched with a selection of superfoods, which add a wealth of nutritional benefits to the mix. The Matcha Explosion recipe is packed with the goodness of ceremonial grade matcha, moringa, lucuma, mesquite, and spirulina enrobed in their rich raw chocolate. 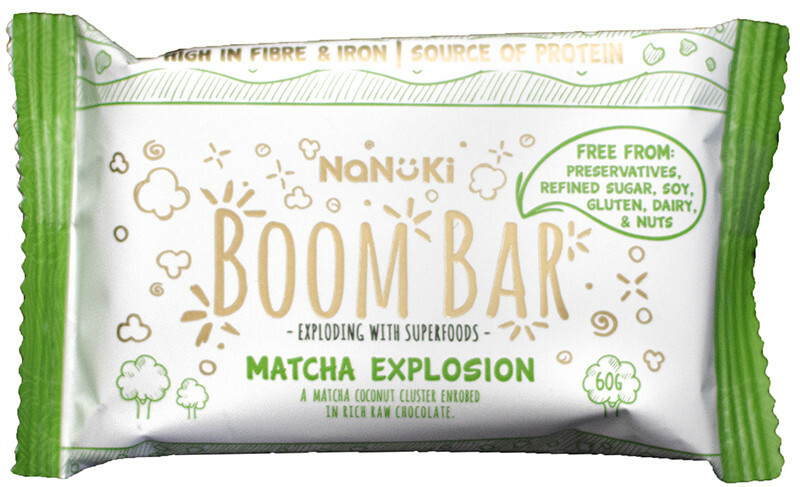 A great alternative to sugary snacks and empty calories – Nanuki Boom Bars are a range of wholesome, filling snacks that will give you a sustainable energy boost instead. The superfoods used to make the Matcha Explosion snack bar all pack a special nutritional punch. If you like coconut ice sweets, you will love this bar, it is definitely not as sweet as coconut ice, but has the same filling texture, with the lovely matcha, cocoa flavor. It is quite energy dense. I would order again. What a yummy bar...like a healthy bounty bar with a twist! I really enjoyed it! Not a fan of coconut but loved this! Love it!! It tastes exactly like a coconut bounty bar. Coconutty filling, hint of matcha wrapped in yummy dark choc. These bars are so worth the hype. The matcha is definitely my favorite of them all. Not too sweet, tasteful explosion, and I just feel good inside while I'm eating it. One is going to be in every order I make..
Coconut and matcha are 2 of my favourite things and this bar marries the two so well. I love the whole Boom Bar range, but this one is by bar my favourite. These are not my favorite of the range...can't really taste the matcha flavor and just really like a creamy coconut bar. But not bad either. I was sceptical about the taste because I don't like coconut but this bar is fantastic!! I really like the matcha flavour and I really like the taste overall. Delicious coconut, not too much matcha and just enough chocolate! A bounty bar re-invented! Highly recommended! Loved this, delicious I got it as a freebie and I'm now hooked. Not as enjoyable as the brownie bar and double the calorie count. The texture and taste were great. I love coconut and matcha and whilst I am a big fan of the other bar, I don't think I will order this one as regularly. Really good. Coconuty and chocolatey! Very impressed!